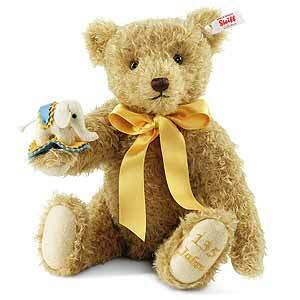 135 Year Jubilee Teddy Bear by Steiff. This beautiful limited edition piece in golden blond mohair and wears the white ear tag, which signifies it as a Steiff limited edition and wears the famous gold plated button in ear. Limited edition of only 1880 pieces worldwide.